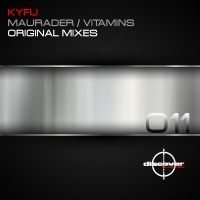 This debut two tracker from Kyfu on Discover Code Red sets its stall out very clearly with the opening track - Marauder. Haunting and with more than a hint of melancholic menace, Marauder winds with intensity, through the gears delivering a dark yet beautiful hypnotic groove. Vitamins is an equally essential tune for your musical diet combining a funky groove with stark industrial stabs that punctuate throughout. 'Marauder / Vitamins' is available now from Beatport and iTunes.